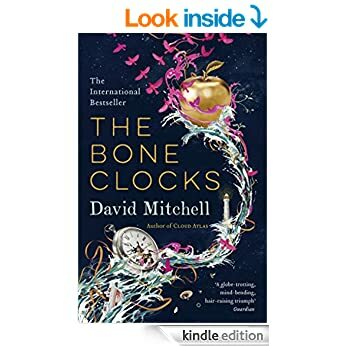 The Bone Clocks by David Mitchell (Cloud Atlas David Mitchell, not Mitchell and Webb David Mitchell, although I like him too and I’m particularly impressed at his marrying Victoria Coren) was mentioned in the article that promoted me to read The End of Mr Y. Apparently “Mitchell has an untroubled relationship with the devices he borrows from genre science fiction and fantasy”, and I think I’m OK with that. The book passes from 1984 – just a little out of my memory, past us and into the future, where I enjjoyed the unforced use of futuristic slang. “I’ll device him”. “These slates are threaded”. In contrast to the traditional “Yer a wizard, Harry” early-book revelations of what is going on, The Bone Clocks gradually lets us see things that are happening, switching points of view to allow us to piece things together as we go, with no promise that our current protagonist will discover the secret themselves (or even necessarily survive). The end is, er, well, not necessarily the best in the world, but I enjoyed the journey so I don’t mind so much. A deus ex machina is tolerable if you’ve known all along that there are deuses around. This entry was posted in Uncategorized and tagged book challenge, book review, reading by charlieedmunds. Bookmark the permalink.